The Visual Science Lab / Kirk Tuck: The two times I met and worked with former President George H.W. Bush. 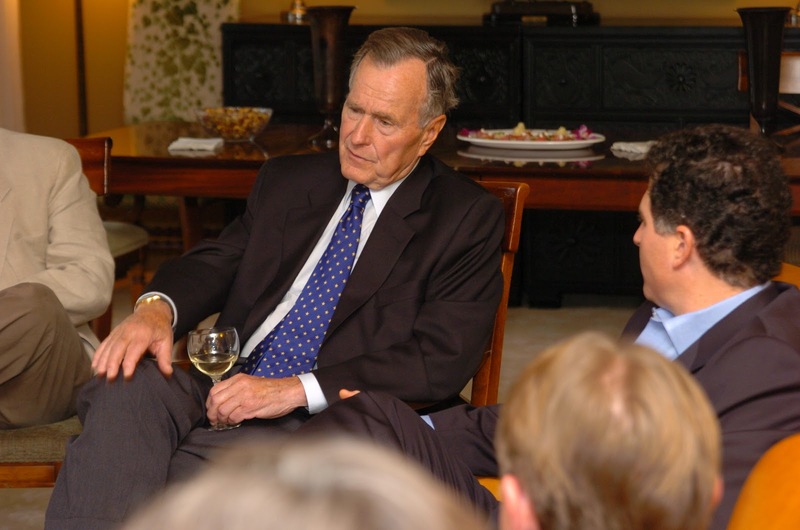 The two times I met and worked with former President George H.W. Bush. 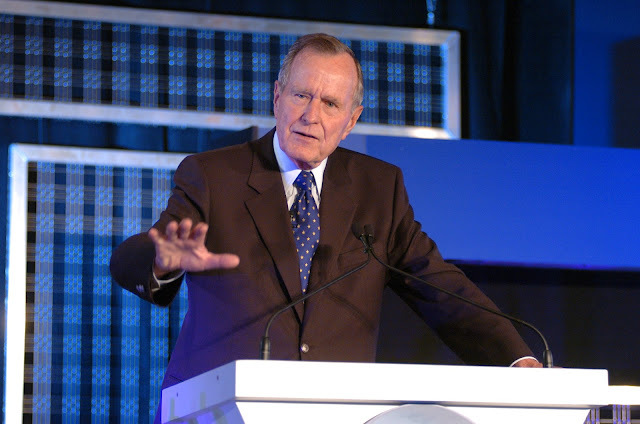 I first met President George HW Bush in Scottsdale, AZ in 1998 or 1999. I was photographing a conference of CEO's and the big event of the week was a dinner at a private airplane museum, out toward the dessert, with a special speaker. The guests would have a cocktail reception and look at the aircraft. At the end of the reception they would line up (about 75 people) and meet the former president. They'd get to say a few words, shake his hand, and then the two would turn toward my camera and I'd take commemorative photograph with Mr. Bush and the V.I.P. guest. I got to the venue a couple hours ahead of time to get the lighting set up and ready. I put up a canvas background and three lights. I pulled a Hasselblad camera with a Polaroid back out of a bag to test my exposure over and over again with sheets of Polaroid, and a patient stand-in. When I figured I had it nailed down as far as I was going to get it I marked spots on the concrete floor with gaffer tape so the president and the guests would have marks I could keep leading them back to. About an hour before we were to start I got a visit from the secret service. It was low key. I was already in the system for the jobs I'd done early in my career with another president. They also figured I'd been pretty thoroughly vetted by my client. And yes, I had been. I also had a ten year history with them by that point. (And I'm still doing work for them in the present....). Fifteen or twenty minutes prior to my start time I looked up to see Mr. Bush striding in my direction. He came over and shook my hand, asked me my name and asked me to walk him through my picture taking process. As we were talking he looked at my suit and I looked at his. As it turned out we were wearing the same color and style of suit. We looked at our labels and they were both from the same maker. Mr. Bush laughed and complemented me on my taste in clothes. I did the same to him. Soon we started the line up and greeting process and we worked as a good team. It was the film days and I didn't want to leave much to chance. I had pre-loaded three cameras and equipped them with three similar lenses. All three cameras were pre-set for aperture and shutter speed. I had unboxed a few more rolls and had them standing by. At one point I got ahead of myself and finished the third roll of film too soon. I needed to rewind and re-load in order to finish photographing all the people still in line. Mr. Bush had been paying attention. I think he saw my look of impending panic. He smiled, nodded and asked the person in front of him --- the next guest in line --- to tell him about his business. He was giving me time to get the camera ready! I re-loaded and looked up, giving Mr. Bush a quick "thumbs up." He nodded and thanked the gentleman in front of him and got back into the rhythm of moving people through; respectfully but also efficiently. After the last person in the reception line shook the former president's hand Mr. Bush walked over to me and stuck out his hand. "Thanks for that," he said, "That was a smooth as it gets." I thanked him for bailing me out by spending a bit more time with that one guest. He just smiled and said something like: "film doesn't load itself." I didn't think I would ever see Mr. Bush again but I was wrong. 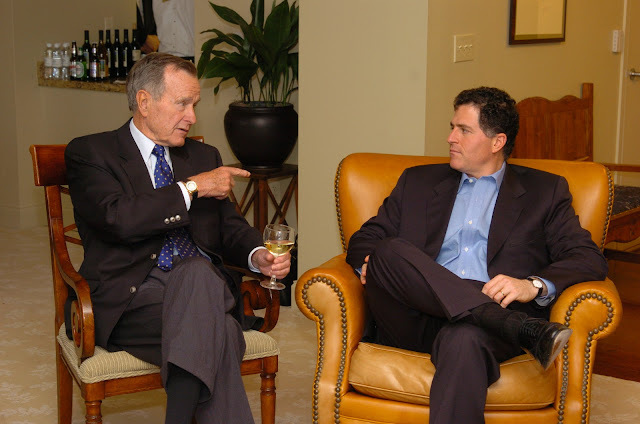 It was Fall of 2004 when the folks at Dell, Inc. invited Mr. Bush to speak at one of their conferences that was held at the Barton Creek Conference Center, just West of Austin, Texas proper. The conference was like most others; various speakers came with their PowerPoint presentations and every once in a while we'd break for coffee and snacks. Near the end of the afternoon Mr. Bush took the stage and gave a wonderful 30 minute speech. My brief called for me to photograph him while he spoke and while he shook a few people's hands in the main conference room. Then he and his security folks (just two) would get into a waiting elevator and head to the penthouse for a meet and greet with a small handful of Dell executives. I rode up in another elevator and entered the penthouse after the president's entourage. 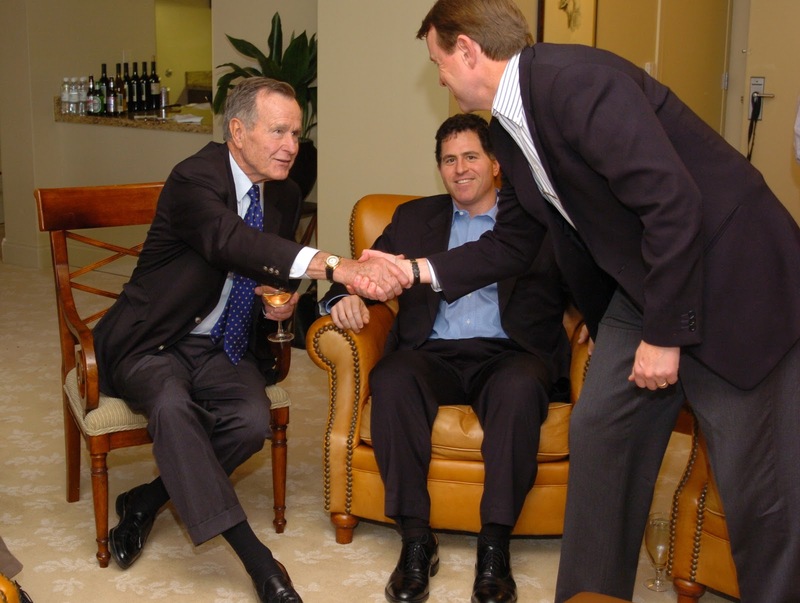 We would be waiting 15 minutes for our host, Michael Dell, and his team, to give the final wrap up speech downstairs and then they would come up for a very casual question and answer session with Mr. Bush. I walked into the penthouse suite and realized that the only people in attendance (at the moment) were me, the bartender, one secret service guy (the other one was positioned outside the door of the suite) and the former president of the United States (and at that moment the father of the current president!). I was a bit intimidated. But Mr. Bush came right over, shook my hand and asked/said, "You look familiar, have we met before?" I reminded him of the show in Scottsdale and he smiled and said, "Ah, that's right. We were wearing identical suits!" I smiled and got it that he really remembered. I was amazed. 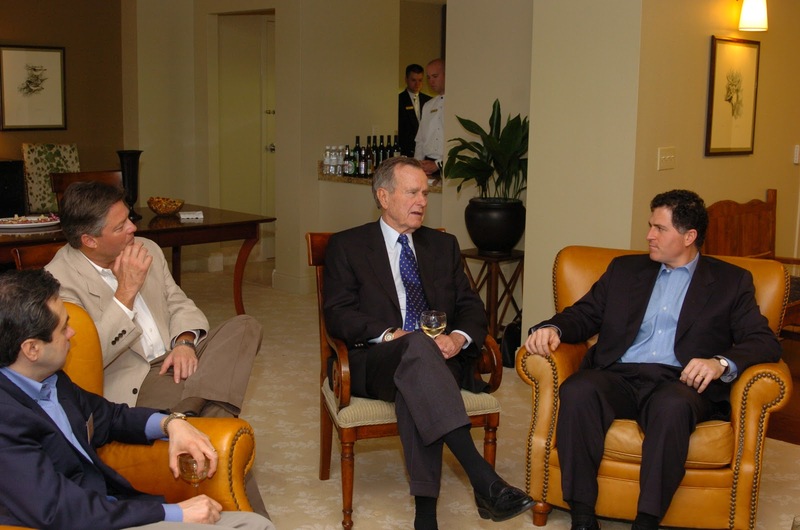 Mr. Bush was having a glass of white wine while he waited for his hosts. It was a very, very nice Sauvignon Blanc. He took a sip and then turned to me and asked, "Would you like a glass of wine? This is really good!" I was quite touched but I explained to him that if the Dell people walked in and saw me with a glass of wine in my hand, chatting up their guest, it might ------ limit my future freelance activities with the company. He said he understood but he also rubbed it in a little. He said, "You don't know what you're missing...."
The rest of the afternoon I tried to be a fly on the wall and not to disturb the flow of the intimate meeting. I waited until Mr. Bush exited the room before I started packing up to go home. On the way home I thought about my afternoon. Mr. Bush was not just the usual politician we saw in fast glimpses on the news. He was brilliant, a great conversationalist, a fairly fluent French speaker and an appreciator of good wine. I was happy to be able to spend more time in his orbit. And I was thankful that my work with Dell, Inc. put me in the position to have that experience. I was struck by how much emotion I felt when I heard of his passing this week. I think he will eventually be regarded as one of the great American presidents of the 20th century. He was a man of my father's generation. Not distracted by glitz and excess but a man who served us with honor and dignity. And he was the only president who has ever offered me a glass of wine. That's so cool. I avoid the political arena these days too, Kirk. It's just devolved into self-righteous displays of some obscure, toxic "patriotism". And man does it make me reflect on better times in our political discourse. I remember the Bush years as well, and the years of Reagan. It was certainly a different time for American politics, but then it was a different time in America. I think Bush was an understated intellectual and a man of true character. 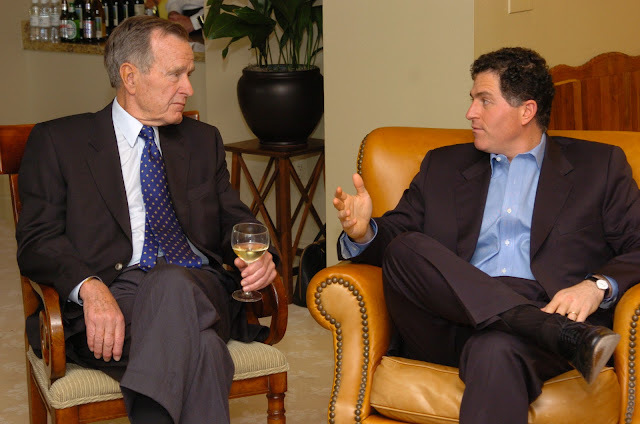 I remember an interview just a few hours after he gave the command to begin the Gulf War. He stated it was one of the most difficult decisions he ever had to make, even though he knew, as commander in chief, it had to be made. He began quietly crying. Asked what made the decision most difficult, he replied it was because he knew his decision would cost people their lives. It broke my heart because it was obvious this was a man of true character and someone who valued human life above all else. Maybe I'm not entirely correct, but what I do know are the politics of today do not attract those of George Bush' caliber. Hopefully we as a country will find a path back to civility, where decency, humility, character and intellect are valued, and expected, in public office and within society at large. But I just don't know. Thanks Kirk, I enjoyed that immensely. Very few heads of countries serve their country with honour and dignity, most seem to do what ever it takes to gain and keep power. President HW Bush was definitely in the first category. Kirk: Some years ago, the former long time caregiver for President Bush's mother helped care for my mother who suffered from stroke induced dementia. The caregiver spoke very highly of President and Mrs. Bush, commenting on their many kindnesses to her family through the years, their deep love for their own family, down-to-earth character, strong marriage and genuine Christian faith. It was an interesting glimpse into a public figure's life, and one I'll never forget. But hasn't it always been that way. As my Grandmother says "It's all swings and roundabouts". Lovely pictures, and a great story! 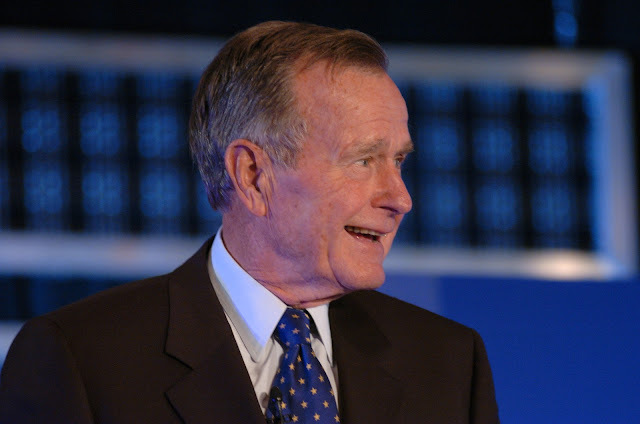 President Bush 41 was probably, sadly, the last of his kind, and this is a great loss to our nation. And I say that as someone who is most often in the other political camp from Mr Bush. He was focused on the country and building the political consensus necessary to tackle its problems with focus on that, not on grandstanding or scoring on opponents just to score on them. While this in no way compares with your very personal interactions, I and several other photographers and reporters covered a press conference that then Vice President Bush held in Lexington, KY during the re-election campaign in late August of 1984. Of course, we photographers were 40 feet away in the back of the crowded room. Before taking any questions, he took time to thank us for being there (it was our job) and acknowledge the "photographers standing in the back," which was unusual--being acknowledged, not being in the back. In those days, I was shooting with a Nikon F3HP and a 180/2.8, my "normal" lens in those days. I also had a Nikon FM2 with a 35 in case I got closer (I didn't). Thanks for the story Kirk, it was wonderful. I think President Obama exhibits many of the same traits-kindness, decency, compassion etc. The late Senator McCain as well. Even H.W. seems to be a more likeable fellow in his older age. Sadly though we seem to be entering an era where few of our leaders exhibit these necessary character traits. As a wise man once wrote, “If you disagree do so civilly.” It’s nice to have been around when that was the norm. Maybe some day we’ll find our way back. thank you for sharing these great memories, Kirk! Neat to see a more personal side of a public figure. A lot of people forget that people aren't completely good or completely bad.